I was very honored when the owner of Petaloo asked me to be a GD this month on their blog. There is also a blog hop next week at the Petaloo blog so come join us and celebrate. They are having a product exchange with Simple Stories’ new collection “Vintage Bliss” and its very girly so I was able to use lots of flowers. Here is a sneak peek of one of the projects I made. Come join us next week to see everyone’s projects and some more of mine. I masked a cherry blossom Crafters Workshop template with some gesso and added these pink forget-me-nots to the stems. Whenever I have a wooden background paper, I like to roll it up to make look like peeled wood or bark. I truly love this effect and have been using it a lot lately. Finally I decorated around the photo using lots of different flowers. Oh wow, this is definitely one of my favourite layouts from all your creations. I so love the woodgrain background with all the pink layering on to of it. Not to speak of the precious subject. Keren, this is fabulous. I love all the layers and how you did the white stems and added the flowers! ( I'm going to have to look for that template). This is just so so pretty! I would agree with Desire, it's one of my all time fave's of yours too! Congrats Keren! The page composition is so cool! I love the wood background! the page is beautiful with soft colors with the gray! Congrats Keren. You've made a beautiful project. Everytime I come to your blog, I start off with a WOW…and that's because your work is amazing & always has that WOW factor! This one is no exception…simply stunning, with gorgeous pretty colours, amazing depth & layers…and I think the cherry blossom background with the added forget-me-nots just really tops this layout off beautifully. Well done & congrats on your GDT spot…they are super lucky to have you designing for them! Gorgeous colours & those sprigs of blossom…with a TEMPLATE…awesome, Keren…you've the patience of a saint!!!! CONGRATS on the GDT!!! That is awesome! I love love love love love your lo!! LOVING the flowers and loveeeeeeeeee the background paper you used!!! This is so pretty.. well done on your guest DT you use flowers superbly!! Beutiful page! LOve the branches with flowers on! Congrats on the GD! Hugs! I'm seriously in love with this layout!! Congratulations on your GDT – you made a very lovely page for Petaloo!!! g.o.r.g.e.o.u.s. it truly is … absolutely g.o.r.g.e.o.u.s. Can you tell that I'm loving this layout? Keren I really, really love this layout, beautiful papers and I just love how you've used the flowers on the stencil! Gorgeous! Wow big congrats! What an honor! 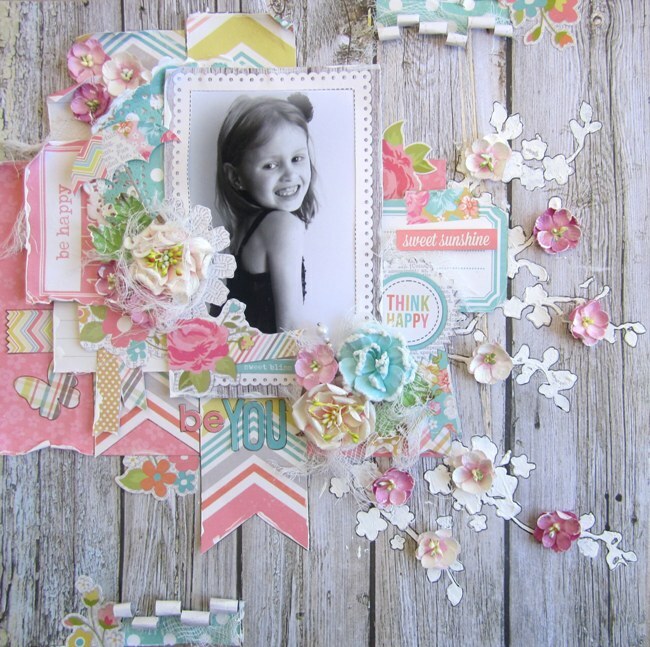 Loving this layout and how you've used the cherry blossoms mask. Just heavenly! congrat's on the GDT at petaloo, I love petaloo… Thanks again for your support on my blog keren, appreciate that…. you have taught me well and shared lovingly!!!! Oh, yum! I love the whitewashed wood background, especially with those trailing flower sprays against it. How cool to have the dimensional flowers added to the stencilling – altogether delicious!